CF: You've written a goodly number of books, including Astrological Games People Play, RoadMap To Your Future, and the more recent SignMates, published by Llewellyn. And, I understand you are collaborating on a new Llewellyn release on Terrorism. You've been looking at personality styles and their consequences astrologically for a long time. You've written computerized astrology reports, including Simpaticos for Matrix, to enable people to look at their relationships by using composite charts. Now it appears your attention has turned to considering issues of past lives in relation to our current charts. Could you tell us something about what you're doing along those lines? First of all, I want to make it clear that this report is not going to tell someone that they were a king or queen in a past life. The focus is on covering the various tendencies we have displayed. The chart that I am utilizing allows for the planets, signs, houses and aspects to be interpreted on a past lives level. The report will hopefully in some cases awaken one's creative potential in this life. It's my belief that within us is an incredible amount of untapped energy. Since the world isn't a perfect place and either are we, there has been no past (or current) life without its ups and downs. So it's important to remember that this report is all about pointing out our past life strengths and where some of the challenges were. It was my intention in the text to identify various creative chart themes that we have used in other incarnations that can still be enjoyed today. My interest in previous incarnations has intensified through discovering what I believe to be a powerful past lives chart hidden within the traditional chart. The chart I am proposing and have incorporated into my new astrology report is based on a clockwise house system. The 12th house is the past lives Ascendant. 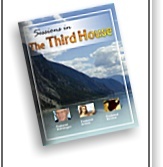 The traditional 11th house becomes the 2nd house, the traditional 10th is now the 3rd house. What was the traditional Ascendant or 1st house is the 12th in the past lives chart. I have found this chart in many instances to be a more accurate description of what I am doing here than the traditional one. I feel it very accurately describes past life instincts. Traditionally when it is said that someone is a double Aries or Leo, this means their Sun and Ascendant occupy the same sign. Some individuals will be surprised to learn that in the past lives chart that they might have a double emphasis on a sign that doesn't occur in the traditional chart. For instance, a person might have the Sun in the sign Leo but have Virgo as their traditional Ascendant. However, in the past lives chart this can change to a Leo Ascendant, if this is the sign on the traditional 12th house cusp (which is the past lives Ascendant). The individual is a double Leo in the past lives chart! I have been asked what if the traditional Ascendant and past lives Ascendant are the same due to an interception? For example, someone could have the sign Scorpio on both the traditional 12th and 1st house cusps. This means both the traditional and past lives charts will have Scorpio as the Ascendant (remember, the traditional 12th house becomes the past life Ascendant). It's interesting that the individual is personifying to the world the same Ascendant symbolism that they have incarnated with over and over. It doesn't mean that someone has projected the same behavior in every incarnation, but the themes have a definite Scorpio tone to them. The chart we have brought into this life represents how far along the journey we have come. The planets in the signs point to past life tendencies as much as do the planets in the chart houses. The planets denote the actions whereas the signs are more indicative of psychological processes we have utilized over many lifetimes. The houses point to where or how we acted out these traits and psychological tendencies. The traditional and past lives charts in my opinion represent parallel worlds. Think about this for a minute, what is being activated in one of these charts is having a simultaneous impact on the other one. That's quite a thought, isn't it? In my opinion, the past lives chart that I have discovered or uncovered, is the mother ship, because its symbolism contains our continuing DNA and past lives memory history. I really believe this new chart (and report) is truly an exciting and unique past life paradigm, through which to get a clear view of our previous incarnations. CF: In various places in the astrological community, discussions of how to handle metaphysical issues like karma and past lives have taken place. Some pretty terrible examples of how not to handle these issues with clients have been given. Would you care to discuss (presuming for the moment that the astrologer's techniques and perspective on the issue are valid) what might be the correct uses of this orientation with clients? How might expanding the perspective of a reading to include past-life influences benefit a client? First of all, it matters little to me if someone was William Shakespeare or just simply a peasant in a past life. The key is that astrology offers a wonderful blueprint or road map through which to gain better self-understanding. My past life work focuses on the themes that we repeatedly are being challenged to work on when we do incarnate. The psychological and spiritual issues are really the keys. Because in understanding our life from this perspective it helps create more options. The benefit to a client in seeing a pattern as not just related to the current life, but as a past lives phenomenon as well, is that it often helps to clarify how strong some tendencies have become. The idea is not to give up because we have indulged in a behavior over and over, but to identify in what ways or directions a person can grow. An analysis of past life influences in my opinion, if done intelligently and sensitively, can create new avenues of awareness for a client. CF: Which leads to my next set of questions. There are lots of people out there with lots of views. The 12th house is sometimes called the karmic house and the sign of Pisces is occasionally deemed the karmic sign. There are astrologers now practicing what is being called Evolutionary Astrology and for them one of the major indicators of past life vs. future life is the planetary nodes, beginning with the Moon's nodes. A woman named Jeanne Avery wrote a book published by a mainstream publisher in the late eighties, entitled Astrology and Your Past Lives. She focuses mostly on Saturn influences in people's charts. Can you give us your own take on Evolutionary Astrology and tell us how you got interested in past-life issues? How did you get interested in connecting these with Astrology? What did you study or who did you study with, to develop your own techniques for looking into these? Can you tell us something of a general nature about the techniques and indicators you use for looking into past-life issues? 3a. First I would like to comment on Evolutionary Astrology. In my opinion, when the symbols are interpreted in such a way as to get a person to take a deeper look at their life, an astrologer has entered the evolutionary trail. I honesty even attempted this in my latest book, SignMates, published by Llewellyn. Even though written for the mainstream market, if you take a close look at the material, it asks people to examine themselves on a deeper level through a comparison of the Sun sign combinations. It's in comprehending the meaning of why we came here in the first place that I think in terms of evolutionary astrology. It was astrologers with this type of focus or emphasis in their work that drew me into the field. When a symbol is interpreted from its most dynamic depth, an astrologer can truly do an evolutionary interpretation. I took this approach in my second book, RoadMap To Your Future (A Quick Guide to Progressions and Transits), reprinted by The American Federation of Astrologers, which covers all of the possible planetary aspects we can run into in a lifetime. The idea was to show life as an evolving process through an analysis of the aspects in terms of Light, Shadow and the Dawn, or finding the resolution to life's challenges. I became interested in past life issues in the early 1970's, when I was a true Sagittarius-gypsy-hippie, experimenting with various belief systems, so many in fact, that my chakras felt like they were doing somersaults. I learned how to meditate and became very interested in Eastern philosophy. There was much talk of having a soul. Ram Dass got me to think in terms of a reality that was far beyond what my mind could perceive, as did a guru I followed. I kept hearing a message that our soul reincarnated, taking on a body and a consciousness that allowed us a chance to make peace with our karma. I sensed there were subconscious messages or tapes within us, from previous lives, just waiting to be accessed. The work of Carl Jung and the novels of the German author, Herman Hesse, such as Siddhartha, kept me thinking in terms of realities beyond our senses. 3b. I intuitively felt the very first time I began interpreting charts in 1974, that I was looking at symbols that went well beyond the current incarnation, telling stories that had been created over many lifetimes. Astrology seemed like the perfect tool through which to tune into these other lives. The planets, signs, houses and aspects, when clearly interpreted, tell fascinating stories about past life tendencies. 3c. Nobody really taught me how to interpret past lives. I never took any formal courses. Though I attended some enlightening lectures and read some interesting books by excellent astrologers on the subject. Stephen Arroyo's, Astrology, Karma and Transformation was quite a book for the 1970's and even for today. Dane Rudyhar's humanistic and wholistic thinking certainly rubbed off on me. Dr. Zipporah (Zip) Dobyns along with Noel Tyl and others did some great pioneering work to help modernize astrology. My own style developed through doing thousands of charts. I think there is a point that when someone truly masters astrology that their own soul growth becomes naturally a part of their experience with clients. A client's past lives speak to me as I get into their session. Certain themes will have a repeating nature to them. I took the basics I had learned, and integrated this knowledge into past life work. 3d. First I look at the Nodes of the Moon. For years I believed that the North node was what a person came into this life to do, while the South node pointed more to past incarnations. Many astrologers preached this thinking, and still do. I have come to believe that both symbolize past lives we have led, as well as deep past patterns we brought into this life. Both of them do this equally! It was the discovery of this new clockwise chart, that has revolutionized my thinking on this subject. Zip Dobyns attended a talk I did on past lives at the United Astrology Conference in Atlanta, in 1998. After my talk, she said to me it was her belief that both of the Moon's nodes described past lives. I agree with her! One major reason being that the clockwise house system shares the same retrograde motion as the Moon's nodes, as though they have similar DNA or life biorhythms. Even retrograde planets are commonly believed by astrologers to point to past life issues. It's interesting that their motion is likewise moving in the same direction as the clockwise house system I am using. It's for this reason that I included in the new report, interpretations for retrograde planets that someone had at birth. The beauty of this clockwise house system is that everything in the chart takes on a past lives significance. In other words each planet can be interpreted in its sign within this house structure. In my own chart, my 8th house Sagittarius Sun is actually in the 5th house of the past lives chart. It's always been my feeling that the more intense aspects (conjunctions, squares, quincunxes and oppositions) carry a great deal of karmic relevance. I especially attach a great deal of importance to a planet aspecting the Nodes of the Moon. The conjunctions to the North or South node, and squares, are powerful past life indicators. Intense aspects formed by Saturn, Uranus, Neptune and Pluto to each other and to the other planets carry strong past life messages as well. Something happens to me or through me intuitively, when I read a chart. I tune into the past life themes that are being repeated, as identified through the various chart patterns. It is just as revealing to notice if progressed planets have changed direction since birth, meaning going from direct to retrograde or the other way around. It can represent a great change in one's use of the particular planet. I have a theory now that transiting (and even progressed) planets, when in their retrograde cycles, are giving us a chance to understand past life lessons related to the planet's symbolism. It brings up the thought that perhaps Mercury retrogrades are a bit disorienting to our logical mind because time in a sense is moving backward. This approximately three week time period is when our mind is trying to remember back to memories that preceded birth. I have found that some individuals with Mercury retrograde at birth flow naturally under transiting Mercury retrograde cycles. It's as though they came in with the memory chip to understand this cycle. CF: This is something I like to ask everyone in the astrology community who has become somewhat famous or well known. How did you get started in astrology? Who or what inspired you to get involved? How did you become a professional astrologer--can you tell us something of your journey? I got started in astrology through an interest in psychology and spirituality. Astrology encompasses so much of each. My mind was blown in seeing how fast someone's chart explained personality traits and other tendencies. I have never found anything to be as accurate and clear to use as a tool. I was in a bookstore in Atlanta one day in 1973, and started browsing through a book by Dane Rudyhar, The Astrology of Personality. Wow! This book really spoke to me and what I wanted to study. It's interesting how my practice got going. I moved to Denver, Colorado, in 1974, to be closer to the guru I had been following. There were over a thousand followers in the city. The word started spreading in the group that I could read charts. I found myself having more chart readings to do than I could handle. Of course, this gave me a great opportunity to dive right in. I moved to North Carolina in 1979 and started to build a practice in the Raleigh-Durham area. I named my business Innovations Astrological Services. I began writing my first book in the spring of 1984, which was Astrological Games People Play. I telephoned ACS Publications in San Diego and spoke with the editor-in-chief at the time, Maritha Pottenger. She interviewed me on the phone for about twenty minutes. Maritha told me to send her a few chapters to review. I was pleasantly surprised to be offered a contract quickly from ACS. The book was released in 1987. It's been interesting to watch people enter my practice from all walks of life. With the release of my other books along with software programs, especially Simpaticos, the composite report for Matrix, I have watched my practice keep expanding. CF: There are always interesting planetary configurations coming up on the horizon. Are there some that you think we should be particularly on the lookout for? I believe the transiting Saturn oppose transiting Pluto that began in July, 2001 and will last throughout the remainder of 2001, will be quite powerful. These two powerbrokers when in aspect to one another show profound changes for the world. Like so many cycles in astrology, there are different levels on which this aspect will be played out. We will likely see countries perhaps becoming allies that in the past wouldn't have been possible. Though since Pluto can denote unpredictable extremes and hidden resentments being released, I expect there will be partnerships falling apart that were once wonderful. Financial trends will probably be weird and strange. Pluto has so much to do with money systems and along with Saturn have quite a bit to say about business trends. Interest rates could fluctuate rather oddly. This could be a powerful time to market oneself. I still think in many instances astrologers miss the boat on Pluto when it comes to understanding the significance of this planet in advising clients about marketing their potential under strong Pluto cycles. We have to remember the passion of Pluto, and that this is what many times can be converted into higher income, as well as the business savvy this planet can bring. Of course, letting go of old worn out life styles and careers will be true for many people this year in particular. Another transit that I believe is significant on a past lives note, that is worth keeping an eye on is transiting Neptune conjunct the Aquarius South node of the Moon and opposing the Leo North node in the U.S. chart of 1776. Wow! Talk about a new look at past lives, this is it! Maybe this is getting U.S. astrologers (and everyone else!) to more actively pursue past life work. Transiting Neptune started making these aspects to the Moon's nodes on 2/4/2001and continued through 8/31/2001. The aspect repeats again on 12/3/2001 and goes through 2/2/2002. There is actually a third occurrence of this aspect starting on 9/9/2002 and lasts until 11/30/2002. I have come to believe that after 27 years in this field, that the Zen-like Neptune is often the more difficult transit to understand. Think about it for a second. At least with Saturn and Pluto, even if you don't like the time period, at least you usually know what you are up against. This is not so with Neptune. It's more like eating chicken broth with a fork. This ethereal-like energy is wonderful to put into creative endeavors, that is, if you can get focused. Is it any wonder the human aura was scientifically investigated for the first time shortly after this planet's discovery in 1846? Anyway, this transit to the U.S. Moon's nodes is sparking a great deal of past life interest in my opinion. Neptune is there to remind us there is another reality. We have a soul and we live primarily in a spiritual universe. Our intuition can become so awakened during a Neptune transit. Though my clients (and myself!) have complained of being spaced out or having divine discontent more than usual. It seems to me that this transit is getting many of us to try to figure out from where we came, before this incarnation. CF: Are there any trends in the astrological community or the world at large that you want to comment on? For example, there's a big move underfoot within the astrology community to raise the general standard of professional skill among consulting astrologers, while at the same time many with no astrological knowledge whatever are selling astrological reports. How do you think these two trends will play out and work with one another? I have never really felt any conflict over this issue. There are some great people that really don't make great counselors. However, they want to sell reports, as this is their own way of contributing. I don't see anything wrong with this. It's a truly unique experience to have a reading or consultation with a competent astrologer. It brings the timelessness of this ancient art & science right into the essence of your being. I said the following recently during an interview about my new book, SignMates, with Mark Lerner of Welcome to Planet Earth Magazine: "You could almost say the astrologer becomes a voice through which a client's chart speaks to the client!" The transformational impact of a live reading has the potential to change one's life in ways that few other experiences can do of this nature. But I still find myself wanting to say that I stand behind the quality of each astrology report that I have written in my career as valuable and insightful learning tools. And one more thing, and I hope this doesn't step too hard on anyone's toes. Yes, I think we need to have professional standards. NCGR and the AFA in particular have done excellent work in this area. Kepler college has become an accredited university, offering a degree in Astrology. But there are some individuals that are terrible in taking tests and yet are quite adept in being astrologers. I wonder sometimes, can you really test the competence of someone to be an astrologer? Yes, a student needs to possess certain technical skills or a sound knowledge of the basics. A student seems to seek me out after reading many books. He or she is wanting to learn how to synthesize the chart details. I find myself trying to teach someone how to relax into "seeing" the whole chart. I do give a short little test to a new student wanting to study with me, mainly to see where they currently are along their learning journey. NCGR was kind enough to grandfather me in recently as a consulting astrologer and didn't make me take the tests. I thank them again! CF: We know something about your emerging work in the area of past lives now. Could you tell us a bit about what else you are doing? Do you have any new projects or books coming up? Also, what areas of astrology have caught your interest most of late? I suppose I will be immersed in Past Lives for quite a while. I am now finishing a new book, EarthDays, for Llewellyn. In this book I am interpreting the Earth herself, and identifying the natural archetype of each of the 365 days of the calendar year. It is a book for the mainstream with a past lives focus, explaining the evolutionary path connected to each day of birth. The book can even be used as an oracle. I am presenting an image that I have tuned into for each day as well. I am describing the Earth as an energy mandala, each day being a mini-mandala. I plan to eventually write a book on the Past Lives Chart that I am using in the new Matrix report. Also, I am busy training individuals to become professional astrologers, locally, and out of state. It has been wonderful to watch these people master the ancient art. CF: Could you name any of the astrological cycles in your own chart you were experiencing while writing the new past lives report for Matrix? Interesting you should ask that question. My progressed Moon was in the sign Pisces and in the 12th house of my traditional chart the entire time I was writing the report. This is the 1st house of past lives chart. This really took me deep into myself. I honestly felt the report at times was being written for me. My left brain on several occasions was really wondering what was going on. The first time I could "see" this chart I became very excited! It was like one minute this chart didn't exist and then suddenly it took shape in my mind. I had a vision of a wheel with the numbers reversed. Another interesting thing is this: transiting Uranus formed a conjunction with my 12th house Aquarius cusp (or Ascendant of the past lives chart) when I discovered this technique. I thought this quite relevant as both Uranus and Aquarius are associated with inventions and surprises, and believe me, this was a surprise. As a matter of fact, it sent a chill right up my spine when I started interpreting my own chart (and that of clients) in this manner, and got quite a glimpse into who I really am, or perhaps it's better to say, who I really was!